Icelandic label Bedroom Community might just be my favourite label at the moment. I can’t think of any other record label that can release such varied music with so few artists. Readers of this blog will already be acquainted with the ‘folk’ singer Sam Amidon and composer extraordinaire Nico Muhly (who seems to have had a hand in most of my favourite albums of the past two years). Joining them on the Whalewatching tour postscript (delayed because of the volcano five months ago) were Bedroom Community mastermind Valgeir Sigurðsson and electronic/noise maker Ben Frost, and four other instrumentalist (including one whose role included providing his hair as a percussion instrument). Having already seen two great performance of the Amidon/Muhly collaborations in January, it was great to see a third reinterpretation of those songs, especially an astonishing version of The Only Tune as the closing song in the main set. On paper, it would seem challenging to join together all the different styles of the artists involved tonight, but it says a lot of Nico Muhly’s influence in the works of the other Bedroom Community artists, that the varied styles complemented each other instead. For example, two hours of Ben Frost’s noisy pieces might require too much concentration in one evening, however by working with a group of musicians and also interspersing them in amongst the more melodic songs it was wonderful to really enjoy them in the acoustics of the Barbican. On two nights this week, I attended two band/orchestra concerts at the Barbican. For one thing, these gigs being performed in the place where normally classical concerts take place, these shows were great because so many of the problems of the standard gigs did not occur. Somehow, being seated in a grand concert hall, people did not talk through songs, we had a comfortable seats, and had great views. For all their similarities on paper, the two shows also had very different outcomes. Efterklang and the Britten Sinfonia, originally uploaded by jellybeanz. First of the week was Efterklang and the Britten Sinfonia. I only wanted to go to this show because I had wanted to see the support band, Jaga Jazzist, for the last few years (it turned out that this was their first show in the UK for about 4/5 years). Sadly, a concert hall set up does not really work well for bands who rely on amplification, however they are probably worth checking out again next year when they are back in a ‘normal’ venue. Prior to getting tickets for this show I had not heard of Efterklang at all. The performance was a great introduction to the band, and it was refreshing to see how the band had integrated with the chamber orchestra, with the band members performing amongst the orchestra members. 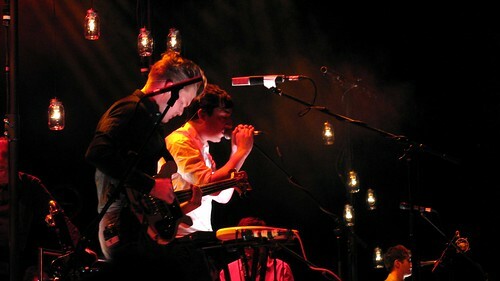 Grizzly Bear and the London Symphony Orchestra, originally uploaded by jellybeanz. 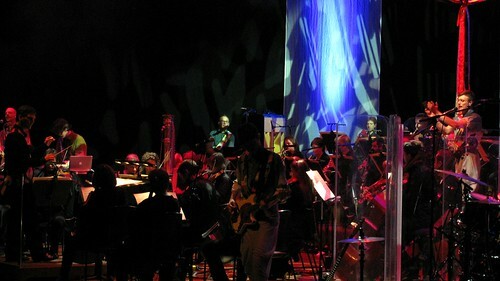 With the quality of the Efterklang collaboration and the programme notes suggesting that this would not be the typical orchestra performing as a backing to the band collaboration, it was disappointing to see that at times Grizzly Bear and the London Symphony Orchestra was just that. Maybe it was just that the months of anticipation and the excellent Grizzly Bear shows over the summer had made me think that the orchestra collaboration would be truly special. Yes, at times, especially for the grander songs like, Ready Able, I Live With You and encore track Colorado, the orchestra did fill out the songs. However, on some other tracks, the band almost drowned out the orchestra (but perhaps this was because I was sitting too close to to the front) and the show did not have the joyful energy that was present at the Efterklang show. Still, it was a beautiful show to watch, and it’s only that Grizzly Bear set such high standards that I had my hopes up for something extraordinary. I hope they recorded the set, and some day release it to show what it should really sound.